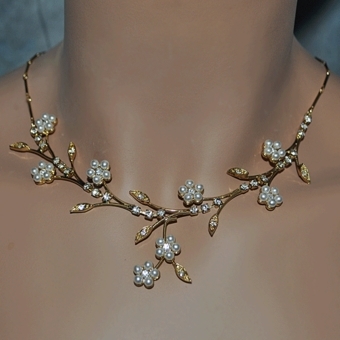 Ultimate Wedding Set in gold has intricate flowers done with ivory faux pearls all connected with gold-plated 'leaves' for a beautiful bridal look. The gold-plated chain itself is 16 inches long, with matching earrings. See the same popular design with white on silver.